I haven’t photographed with a wide angle lens in my garden for many seasons. The crisp circular pattern of paths that originally defined the shape and structure of the garden declined over the years, shifting under the influence of weather, gravity, and life’s unexpected challenges. 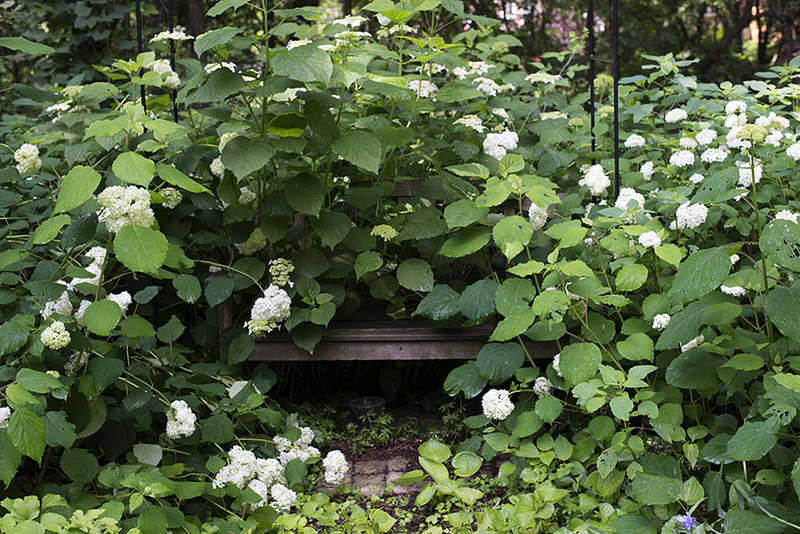 Last summer’s heavy rainfalls rendered the paths unusable at the lowest point of the garden and moisture loving plants – Hydrangea, daylilies, Lobelia – quickly colonized the rich muck. Perhaps you remember a post from last year, That Particular One, where all of my garden photos focused on the details of flowers, excluding the messy bigger picture. But this week, the wide angle lens went back onto the camera and I celebrated the renewed structure and shape of the garden on the completion of the rebuilt paths. Determined to reclaim my horticultural territory, I hired a local company, Best Feeds Outdoor Design, to dig out the dirt of the paths, add edging and drainage, and fill with various layers of gravel. Muscular men dug and removed cubic yards of soil and wheeled in barrels of stone in extremely hot and humid weather, a job I had unrealistically expected to accomplish myself until I came to my senses. Now, the original shape of the garden I designed from the upper deck looking down has been restored, and not only has the appearance of the garden changed dramatically, it is a pleasure to walk through it. Since most of my free time is spent in the garden, I often tend to see it as a metaphor for my life and this newest development was no exception. What struck me immediately as I meandered through the paths was how different the garden looked and felt, even though the same plants were in the same place – all the beauty of blossom and leaf remained but were framed in a very different way. Restoring a firm structure made them appear more beautiful than before, like adding a frame to a painting to add definition and draw the eye. What had become a chaotic ramble among lovely plants is now beauty contained in a pleasing form, a balance between strong lines and cascades of color. The wild woodlands surrounding the garden now seem even more mysterious and primeval in contrast to the firm human hand of design and form. This shift in perception has made me consider the desirability for clearer boundaries in my own artistic life, perhaps finding a better balance between daily structure and creative abandon. I’m beginning to turn a wide angle lens on my life, looking for balance and beauty in the big picture. 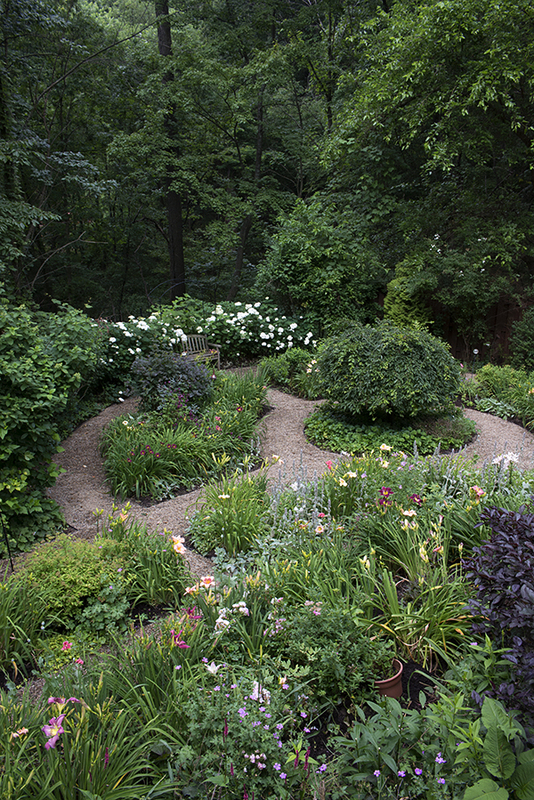 Enjoy some images of the restored garden; click on any photo to start the slide show. (All images ©2014 Lynn Emberg Purse). This entry was posted in Garden, Garden Design and tagged Best Feeds Outdoor Design, flower gardening, garden structure, gardening, metaphor of paths, paths by composerinthegarden. Bookmark the permalink. Thanks, Diversifolius – I like the idea of yin and yang in the garden. Absolutely breathtaking. I can’t imagine all that you enjoy in that slice of heaven. Your hard work is paying off. It’s a beautiful sanctuary. Marie, thank you for your lovely comments and for the follow. I hope you enjoy what you find here. Yes, it is a slice of heaven here. I enjoyed visiting your blog too, especially loved the story about your father. ‘I’m beginning to turn a wide angle lens on my life, looking for balance and beauty in the big picture’………that sounds some what of a ‘turning point’. Your garden, by extension, could be dubbed The Lynn Purse Gallery of Beauty, Balance and Living Art. And thank you for suggesting the CBGB movie over at the ‘Frank Place’. I knew it was out there, but for some reason it vacated my brain. I was only there once back in March of ’83. Hudson, thank you for such a great comment; I am humbled. I think you will like the CBGB movie; we enjoyed it immensely and it was amazing to see an amazing slice of history of rock ‘n roll. Beautiful work …. cheers to all involved and to your work over the years. I can see how this is your sanctuary! Thanks, Frank! Yes, Indeed, this is my sanctuary; I’ve become a little less social this summer, just prefer being in the garden instead of going somewhere. Lynn, your garden (as always) is just magnificent! I love the ministry of each set of plants as one circles the tree (is that a dwarf hanging Japanese cherry tree?). But all roads lead to a place of peace at the bench. I also love your metaphor about taking the wide lens to our lives. I thought when I retired, the creative parts of my life would fall perfectly in place with the correct balance of order and creativity. I am more overrun with the “weeds of life” than ever before. I’m way too old for this. Got to find the balance. Thank you for reminding me of the overhauling that needs to happen in my life. Order out of chaos–that’s often literally what I’m attempting to accomplish when I look through the viewfinder. Despite the tangible association, having read this incisive post the metaphorical meanings seem even more apt. Enjoy your beautiful garden, Lynn. Thanks, Kerry. I also think of the camera viewfinder as putting a frame around, and organizing, the elements of a picture. In fact, I used to present a lecture called “The Photogenic Garden: the Camera as Design Tool” which was all about using that frame to build vignettes in the garden. Obviously, I’m still using those techniques 🙂 I’m delighted to hear that you liked the metaphor; it is something I continue to ponder. Thank you so much, Kitty, as always, for your generous comments. The garden is getter lusher by the minute, as we had copious rainfall last night and most of today. The good news is that I could walk in the lower garden this morning without getting muddy or wet – yay! Very inviting! If you haven’t already, please read Elizabeth Gilbert’s The Signature of All Things. A Celebration of the Plant world and gardening. Beauty, pure and simple-in the structure and the wilder areas. I seem to overestimate my ability to do things in the yard myself, then am disappointed when I am not able to do them. So much smarter to call in the strong backs to handle the tough stuff and use your talents for the main attraction-the plants. Hope that you enjoy many cups of coffee overlooking that garden. Yes, yes, yes to all you said – on my way out so not much time now, but… I so appreciate the way your tendency to look at what’s beyond and behind and underneath. The garden is gorgeous….visions of similar tasks years ago, hot days when I worked as a gardener on an estate. Thank god for hard working, strong-backed men who were a real pleasure to be around and could accomplish everything I could – or would – not. Amen to that! I knew what needed to be done but didn’t have the physical stamina to do it. The guys who did the work were very conscientious and very pleasant to be around; Angel loved them and greeted them with joy each morning. I like your comparison of the paths in your garden to the frame around a painting. That’s a good insight. Thanks, Steve. The new paths have been inspiring me all week. Some food for thought here in your wide-angled perspective, Lynne. That sounds like a healthy balance striving between daily structure and creative abandon. I very like the ‘metaphor of paths’ and how we can structure them. Thank you, Nature! Every time I walk through the garden, I continue to be struck by that metaphor. It continues to fascinate me. Thank you for taking the time to comment so thoughtfully.